Is it an ominous sign, or just another step on the journey back to normalcy? For the moment, the jury’s out, but there’s no question that the benchmark 10-year Treasury Note’s yield is upwardly mobile these days. Yesterday’s jump to 3.71% elevated the yield to its highest since last November. What does it mean? 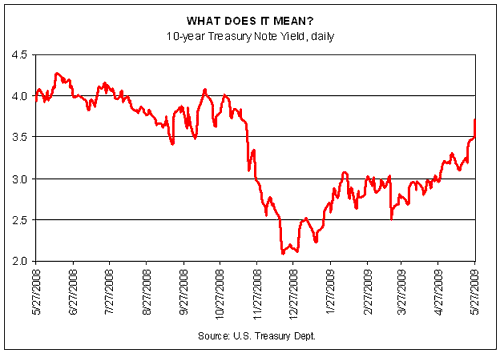 One interpretation is that the yield is simply returning to something approaching normalcy. As the threat of economic and financial disaster recedes, the price of money is expected to return to levels that prevailed before the world seemed to be coming apart in the last four months of 2008. That implies a return to the 3.5%-4.0% range for the 10-year, a range that was prevalent for much of last summer. But in the current economic climate, nothing is quite as benign as it appears. Recall that it was only in March that the Federal Reserve announced that it would buy long government bonds to keep long rates low as part of its efforts to stimulate economic recovery. Immediately following the news, the yield on the 10-year dropped by an extraordinary 50 basis points in a single trading session, closing at around 2.5% on March 18. As of last night, the 10-year yield was 120 basis points higher. What does that say about the Fed’s plans to keep rates low? One theory is that Bernanke and company have failed because the market has called their bluff by raising long rates despite the central bank’s best laid plans. Following this line of analysis, the Fed has diminished its prestige and influence by promising to keep long rates low and failing miserably at the task. Perhaps, although one could reason that if the economic outlook has improved since March, which arguably it has, the central bank may no longer be so keen to sit on long rates. It surely hasn’t gone unnoticed that the sea of liquidity that’s been created over the past 12 months presents an inflation risk if left untended once the economy recovers. It’s reasonable to assume that pulling back on the extreme state of monetary injection must be done gradually, over time, in which case the recent climb in the 10-year yield may be one example of letting the market move rates back toward equilibrium. Adding to the notion that the worst of the recession may be behind us is this morning’s news that the trend in new initial jobless claims continues to moderate, which suggests that this data series has peaked. If so, that’s a sign it’s no longer appropriate to price long bonds on the assumption that Armageddon is lurking in the shadows. (For some background on jobless claims as a window into the timing of the business cycle, read our post from last week.) Adding to the positive news is today’s report that new orders for durable goods orders for April rose 1.9%. It’ll take many more months of growth to repair the huge drop in orders over the past year, but at this stage every positive sign is welcome. Nonetheless, it’s still too early to declare victory over the dark forces of contraction that continue to stalk the land and so rising long rates may still pose a risk. One of the more worrisome theories is that the 10-year yield is rising primarily because of inflation fears rather than optimism about growth’s prospects. In that case, higher yields will only increase the challenge that awaits in trying to juice the economy. It’s not yet clear where the truth lies. As such, we’re now entering a new phase for the economy and one with an evolving mix of challenges and questions. Deciding if higher yields are good or bad news will take time. Meanwhile, the market being the market, one can’t rule out a fall in yields in the near future and rendering the current discussion moot. Stranger things have happened. But while we’re still struggling to figure out what comes next, it feels like we’re at a critical juncture. Exactly how critical and why it’s critical isn’t yet obvious. But if the 10-year yield continues climbing, rest assured that the money game is about to change in more than a trivial way.